We’re in the midst of a seismic shift in collaboration. 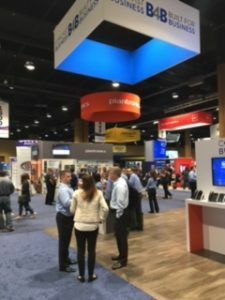 At Enterprise Connect Orlando 2017, these considerable changes were highlighted and their affects were analyzed. There’s now a significant migration to cloud-delivered services and accelerated adoption of UCaaS. This is accompanied by a growing demand for team collaboration apps with interactive meetings, a rise in new products for physical meeting spaces, and a steady stream of new APIs. After attending this event and digesting everything that was unveiled, IVCi’s executives offer their keen insights on the interplay of these major industry trends and their impact on the future of collaboration. “Spark board is truly innovative, which is something I look for when judging,” said Robin Gareiss, president and founder, Nemertes Research. “There were many compelling entries this year, to be clear. What intrigues me about Spark Board is that it changes the way people meet, with two key enablers: the price point is affordable, and the product is intuitive so there will be a low learning curve. Also, the extensibility to multiple devices brings people into the meeting regardless of location. And finally, the ability to store and retrieve documents and drawings for the next call keeps efficiency high. This blog was originally published on https://www.ivci.com and shared with AV Network by permission. Learn more about using collaboration to overcome business challenges and improve outcomes. VisitIVCi for more info.